Over the past couple of months we've talked a lot about freelance writer sites -- 5 great freelance writer sites as inspiration, what your freelance writer site should include, why I think you should include rates on your freelance site, and more. Today let's look at another feature you might be considering adding to yours -- an email list. Now some marketers will tell you it's always a good idea to build an email list for any kind of business. 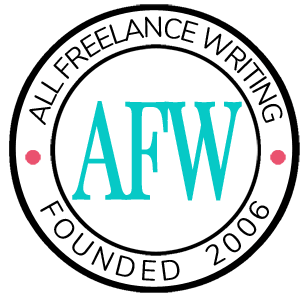 But is it actually necessary when it comes to freelance writing services? In my own case it's never been necessary. I get plenty of inquiries without it. It's an extra commitment I'd have to make (when again, I don't really need to right now). And those are precisely the reasons you don't necessarily need an email list either. First there's the issue of supply and demand. You aren't selling products. You're selling services that rely on your time. And you only have so many available billable hours. That's one of the perks of freelance writing. As long as you're charging professional rates, you don't need that many clients to keep your schedule full. If you were selling products, it makes total sense to build a list so you can maximize sales. But with freelancing, you need to reach far fewer people to reach your sales goals. Building a list of thousands of subscribers sounds great. But it takes work. And you don't need thousands of prospects to keep yourself fully-booked. This alone means freelancers don't really need email lists. They're about two main things: relationships and scale. There are plenty of ways to build relationships though. And freelancing isn't a game of scale. The other issue is the time commitment. One thing I frequently remind newer freelancers of is this -- it doesn't matter if a marketing tactic works; it matters if it works better than your other options. Just as you have a limited number of billable hours, you also have a limited amount of time to devote to marketing your freelance writing services. So you want to get the most out of that time by focusing on the most effective tactics and tools available to you. Think about how you already market your services. What works? What doesn't? Are you already filling your billable hours? Or do you need to add a new tactic or change things up? If you do need to attract more clients, an email list might work. But will it work better than all other options available to you? That depends what you're already doing. And who your target market is. And what kinds of services you're selling. And how you intend to use that email list (such as simply for direct promotions versus using it as a thought leadership tool to position yourself in a competitive market). Managing an email list requires not only time, but consistency. How do you plan to use the email list? How often do you plan to send emails? How long will that content be (how long will it take you to write the content or copy)? How will you build the email list, and how much time can you devote to that? Think about the time investment, not just in setting up a list and getting a form added to your freelance writer website, but also the ongoing time commitment. Which of those marketing tactics, including managing an email list, is likely to bring in the most paying work? How long will it likely take to see a return on your time investment for each marketing tactic you're considering? Would investing more time in an already-successful marketing tactic potentially yield better, or faster, results? It can easily turn out that managing a new email marketing list will require a bigger time investment than other tactics that could bring about similar, or better, returns. Combine this with the fact that freelancing isn't a matter of scale like so many businesses are, and email lists simply aren't a necessity for many writers. And doing it just because people like to promote email marketing as a must-have for everyone could leave you wasting time on something you don't ultimately stick with. Finally, there's the issue of conversions. What do you want visitors of your professional site to do? Do you want to convert them into subscribers so maybe they'll buy something later? Or do you want to convert them into clients by getting them to contact you directly right now? You can't count on converting site visitors in multiple ways on any given visit. So what do you want your site's copy focused on -- promoting your email list or promoting your services? Every page should have a goal. So for every page you'll have to choose. Splitting your visitors' attention between multiple calls-to-action could hurt more than it helps (this is something I've seen with my own blogs that offer both email sign-ups and sales-directed CTAs -- it's a balance you'll need to figure out for your own market). Frankly, one of the biggest issues I've seen in reviewing freelancers' websites is the lack of CTAs to begin with. Check your own site, and start with adding or improving ones directed at making sales before directing visitors toward other actions. While I'd consider email lists far from a necessity for most freelance writers, there are cases where they can make sense in your marketing mix. For example, you might not maintain a public list where you try to attract sign-ups, but you might keep a more private email list of past clients you've worked with for the sake of traditional relationship marketing and staying fresh on the mind of previous and current clients. Because relationships are so vital in freelancing, this kind of list might work very well for you. You also might not sell only writing services. For example, if you also offer consulting of some kind, then thought leadership and promoting your authority status in your specialty area becomes more important. In that case, having some kind of ongoing publication can be a good idea, such as a newsletter or blog (where you make posts available via email). Or perhaps you sell a product to freelance prospects -- a lower price point buy-in to acquaint them with your expertise and style. In this case you have a product to sell, and an email list could be a good way to promote those sales. Examples might be an e-book or a course. And then, of course, there's the case where your current marketing isn't working and you do have reason to believe email marketing could be a more effective use of your time than other options available to you. 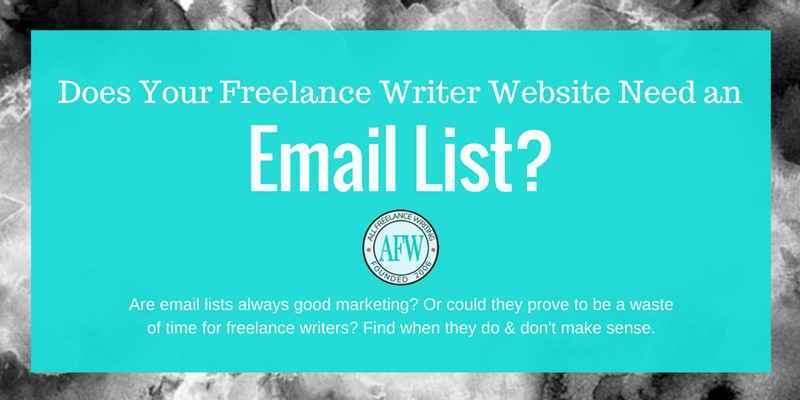 In any of those cases, adding an email list sign-up to your freelance writer website might make sense. As with any kind of marketing tactic, don't follow generic marketing advice that doesn't account for the realities of running a freelance business. What works for other kinds of companies isn't always the most effective use of time for freelance writers. Evaluate your options. Figure out what you are, and aren't, comfortable trying. Decide if you're willing to invest the time long-term. And only then can you decide if adding email marketing to your mix is the right decision for your business. Hi Jenn, this is a great post! I think a lot of people are following trends and what’s hot right in promotion now without thinking whether they need to do it or not. It’s refreshing to see a different point of view that challenges us to think about our marketing tactics and what we want to get out of it before diving into them. Thanks for sharing! Thanks Ida. I’ve long been against following generic advice, and one of my aims on this site is teaching freelancers how to tailor the things they learn and pick up from third parties to their own businesses. Not everything works the same way in every business type or every market. And unfortunately marketing advice all too often seems to come in “this way or the highway” framing. It doesn’t help when companies constantly release bad, poorly-interpreted data skewed to make their points, and frequently share very limited-focus case studies as if they represent a wider norm. I can understand how folks get sucked into some of the nonsense, and I’ve seen too many writers end up frustrated because they feel like they’re doing everything right by parroting someone else rather than learning the fundamentals to build upon in their own market. Then they don’t get the results they were “promised” by the person giving the advice. A simple thing to keep in mind is that once something becomes a trend, the real thought leaders have likely already moved on to other things. If you want to stay ahead of the curve, you need a background in those fundamentals so you can adapt to market and environmental changes (new tools, services, sources, etc.) without waiting on someone else to lead the way. I agree, it is not necessary to attach an email list to your freelance website. As long as your communications skills are clear on your website, there is no need to put in that extra work. As mentioned above, the best thing is to explore your options and find out what works best for you. Great post! What I would say is that if you choose to have an email list then you need to be consistent with it. You can’t just email once, then wait six months and do it again. Not only will your unsubscribes rocket, but most people will have forgotten who you are in that time anyway. I feel that an email list is an effective tool for people who don’t yet have a “personal brand” and need to cultivate stronger relationships with the people who they do already engage with. Plus it does provide a marketing channel that is effectively free, so there isn’t much too lose if you do want to try it out. The issue for a lot of freelance writers (especially newer ones who make up the bulk of visitors here) is that email lists aren’t free for long. For them to get the most out of them via automation and such, they’ll generally have to pay. For most of us, that’s not a big deal. It’ll pay off. But it’s not uncommon for newer writers to have no marketing budget to speak of when they’re new and struggling to land their first several clients. For them, and email list wouldn’t help much, free or paid. The time they’d spend building a subscriber list in the hopes of converting some of those people later would almost always be better spent directly marketing their services in other ways. Email lists make much more sense for more established freelancers, or those on the higher end of the pay spectrum, where demonstrating expertise and cultivating industry relationships in a specialty area can matter much more. Even then, it’s not necessary — more PR benefit than direct marketing in the long run. But in that case, I absolutely agree. They need to focus on relationships and consistency. Think in terms of a publication almost more than just a marketing tool. Have a content strategy that’s both continual and not just about their services — the list itself has to serve their target clients. That’s where I tend to see freelancers in general go wrong. When I’ve bothered signing up for their lists they’re not only sporadic, but there’s nothing in it for me. They often get used as promotional announcement tools and not much else. It’s a shame because there’s a lot of potential there when they’re done well. But they still work better in businesses where people need more than a handful of customers at any given time and a few more in-waiting. My biggest hope with this is more new writers understanding that scope better. It can go a long way toward minimizing the intimidation factor of landing new clients when you realize you don’t need to appeal to massive numbers of people. And with email lists, people have a tendency to focus a little too much on raw numbers which would be counter-productive for a lot of readers here.